I’m in complete chaos. I have so many books on the go that it feels like a traffic jam of books and none of them are shifting. There’s a dangerously unstable pile of them on my side table that’s so tall the children can’t get round it to reach the fruit bowl any more. Something drastic needs to be done, or I’ll have scurvy as well as abandoned books on my conscience. I’m no great fan of poly-reading, but for the purposes of regular book-blogging, it is undoubtedly useful. The problem is I have stacks of books that I started, but have left unread for weeks at a time because I’m not enjoying them as much as others. They sit collecting dust, while I merrily embark on something else. Just the sight of them makes me feel guilty. The main culprit is Samuel Richardson’s ‘Pamela’. I’ve been reading it for months but I’m only just under halfway. Every now and then I’ll read a page or two and write a post about it, but the slow progress is torturing me and I need to get it finished. I can’t wait to reach that sweet PFZ (Pamela Free Zone). So, I’m self-imposing a ban on any reading that isn’t ‘Pamela’ until I’ve turned the final page. It’ll be tough but it needs to be done. Once it’s finished, I know that I’ll feel as light as a feather in a wind tunnel. To be Pam-free will be to experience a very bearable lightness of being. I’ll be able to immerse myself in any fabulous book that I choose – for a day or two, at least. After that, it’ll be time to shift another unfinished hulking tome that’s been gathering dust – yes, ‘Little Dorrit’, I’m looking at you! I feel like I need a manual on how to organise my poly-reading! I’ve been sneaking in the shorter reads for a while now, and then so much time goes by that I’ve lost connection with all the earlier books. 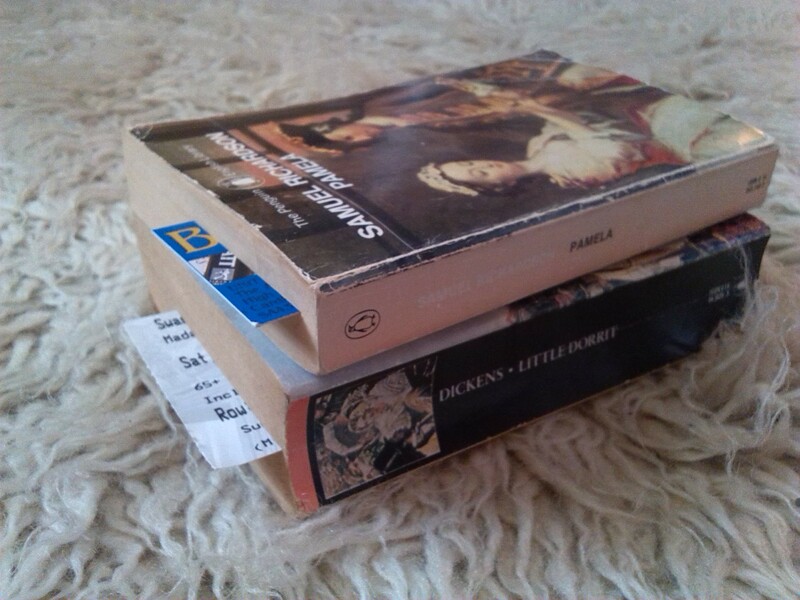 Pamela is a bore, but ‘Little Dorrit’ isn’t, it just got forgotten, and now I can’t quite remember where I’d got to. It is all very confusing, so I think I need to clear the decks a bit before I launch into anything new. I get like that – just to clear some books and start again! Sarah that’s quite spooky, I was thinking last night I should have a ‘Clarissa day’. I have about 250 left to go, and should just imprison myself and get it done. Over. NO MORE RICHARDSON, YAY! Oh, no! Poly-reading and the health danger of our children (i.e. fruit bowl maze). THE Pamela might have written a song about your struggles. haha, yes! The pages and pages she’d write – it doesn’t bear thinking about! Oh dear, Pamela is drier than a dust bowl. I started reading it last year during Christmas break, but I had to break up with her in May because I just fell asleep every time I tried to read more than just few pages. I wish you luck with your ban and hopefully you’ll reach the PFZ soon. (Will be adopting the acronym for sure). Yep, totally dry. I need to keep a bottle of water at my side as I read Pamela in case I get dessicated in the process! Many thanks for visiting my Implied Spaces Blog. it is much appreciated. All good advice there, but I’m afraid I’m very good at breaking my own rules. I did set myself the challenge of reading 10 pages a day, but conveniently ‘forgot’! It’s reached the stage where it’s got to be done, and severe measures are called for. Neat idea. I’m always surprised at the things on the Internet archive. I suppose it’s a lazier way to get through older books. I once though I might use text to speech on anything available by public domain, but I think the electronic voice would grate on anything longer than a short essay! Just finished your article and I am in a daze. I cannot relate in any fashion to what you have written. I can honestly say I have never read a book I have not enjoyed. I can say that, simply because I refuse to read books I do not enjoy. I also refuse to go to ballets and operas for the same reason. I don’t enjoy them. Books, to me, are an escape from my day-to-day life. I enjoy my life, but like most of us, I long to take a break every now and then. Reading is at the top of my list of escape plans. Reading a well-written book, that I enjoy is a mental message, an imaginary day at the spa. Why would I want to torture myself by reading a book I don’t enjoy? I admire your determination, but I don’t understand it. Poor you – I agree with Lucy, once you’re done you have to call a halt to Richardson. Reading should be fun dammit. I’m saying this as a fan, by the way. I love both Pam and Clarissa, but I’ve never even picked up Charles Grandison, even after Austen’s wonderful spoofs, because I know what it will lead to. I’m glad it’s not just me that has a bogey author! It does seem stupid to get bogged down with a boring book when there are so many wonderful novels out there, but I don’t want to give up on it. Ironically, I think I’ll enjoy it more if I immerse myself in it rather than dipping in sporadically. Polyreading can lend itself to diminished interest and focus. It’s a good idea to wall a single book off, if not always easy to put into practice! That’s exactly it! With poly-reading, I miss the total immersion, and i think that split focus across multiple books makes it harder to really engage with them. I suppose it’s a necessary evil, but I need to reduce the number of books I take on at one time, and i’ll have to accept that now and againg I’ll need to do bouts in solitary!